Macro’s Supercom Supervisory and Control System for blown and cast film lines has recently been upgraded to include an optional thermal imaging system that allows processors to monitor bubble temperatures from anywhere an internet connection is available. 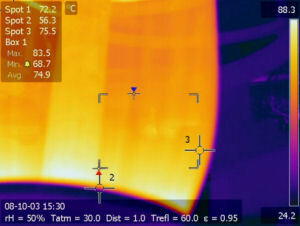 The system consists of one or more infrared cameras that target specific points on the bubble to monitor temperatures. The data is displayed in real-time on the Supercom HMI and stored by the supervisory system for future analyses. The system can also be used to monitor a configurable zone to provide a broader range of observation. Alarms are easily programmed to bring attention to any temperatures that fall out of the desired maximum and minimum thresholds. In addition to on-site alarm signals, an email is automatically generated with a snapshot of the screen and sent to offsite personnel for immediate notification of temperature-related problems. The cameras can also be directed at specific line equipment, such as the die or extruders, to monitor preheating during early morning or overnight startups when supervision may be limited. If equipment temperatures reach unsafe levels the system will automatically shut down heating to avoid damage to the line. The upgraded software allows the user to run analysis tools, set up alarms and scheduled data collection events, and adjust the cameras settings. To learn more about on Macro's SUPERCOM click here.